Who doesn’t love a one pan meal with all the ingredients infused in the one pan and less washing?! 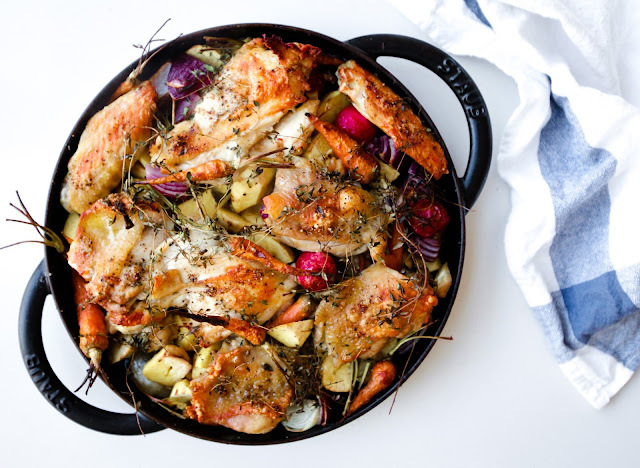 Our current family favourite meal is this one pan roast chicken with sweet potatoes, baby carrots & radish. I’ve been using my Staub griddle in the oven for our one pan dinners (and in the mornings for my oldest’s breakfast steak & asparagus) it’s been one of the best kitchen investments I’ve made and our one pan roast chicken comes out perfect! My kids all fight over the crispy skin which is simply seasoned with salt, pepper and olive oil. My trick to making the skin super tasty is an extra sprinkling of salt on the skin just before roasting so the salt granules don’t dissolve in the chicken but sit on top of the skin. I also do love adding some paprika but currently being nightshade free I leave it out, feel free to add some in. This recipe works well for a young chicken or a normal sized chicken cut into pieces (about 800gms). 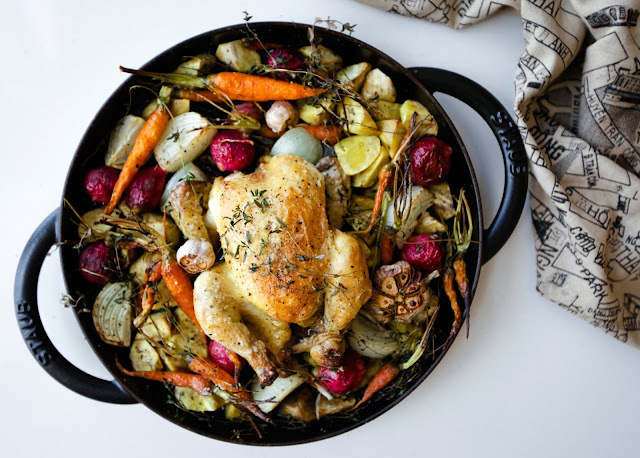 The whole dish should be ready in about 30 minutes, if you wish roast a whole normal size chicken the time should be adjusted. If using a young chicken that is around 400 grams you can use 2 chickens. I feed my whole family with this portion as we bulk our plate up with lots of greens in addition to the roast veggies. Serve with steamed veggies and a crispy green salad, don’t forget to pour the tasty pan juices over the chicken! 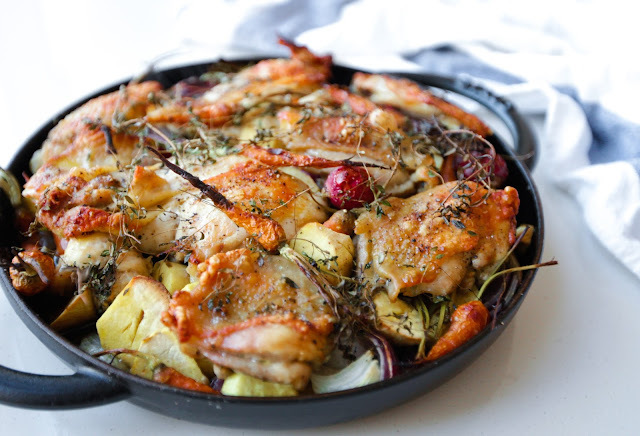 You can also check out my other simple roast chicken recipe here with paprika. 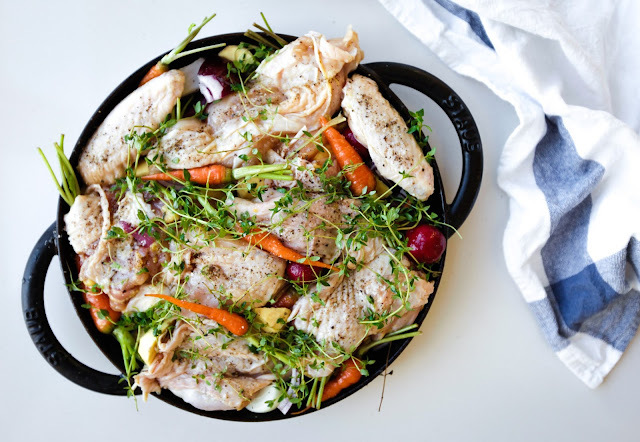 Serve with steamed veggies and a crispy green salad, don't forget to pour the tasty pan juices over the chicken! Yummy!! 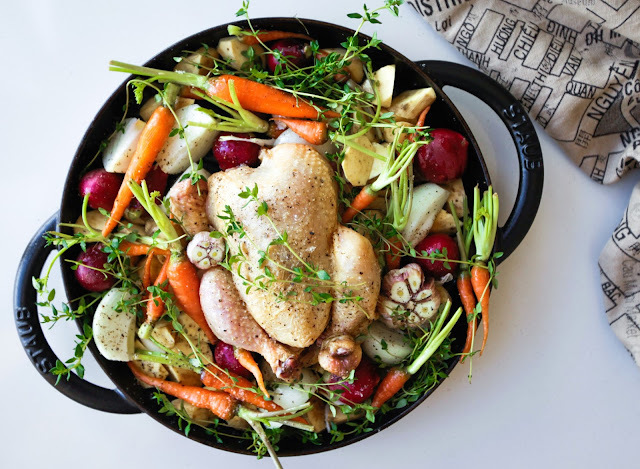 Delicious Chicken roasted in pan..I think there wouldn’t be anything more palatable like this.thank you very much for sharing.keep posting.